Special education teacher Lamikco Magee of Amherst was among the crowd on Saturday. 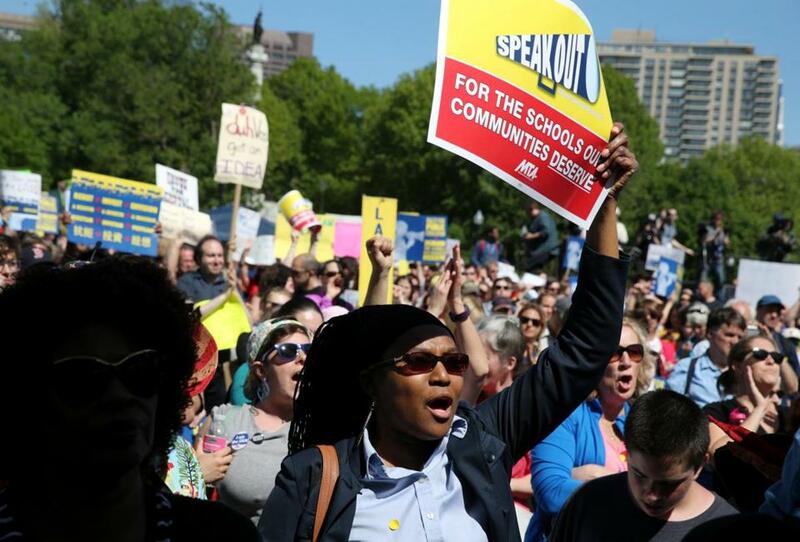 A rally for public education drew more than 4,000 people to Boston Common on Saturday, in opposition to anticipated cuts of $10.6 billion to federal education programs under President Trump’s new budget. Teachers, parents, and students performed music as protesters cheered and waved signs. Under the Trump budget plan, the cuts would include mental health support, advanced coursework, arts education, and after-school programs, according to the Washington Post, which obtained a near-final version of budget documents. The administration also is seeking to spend about $400 million to expand charter schools and vouchers for private and religious schools, and $1 billion to push public schools to adopt choice-friendly policies, the Post reported. Though public schools are “not perfect, some of the best experiences I’ve ever had have been in public education,” said Rasheem Muhammad, a 17-year-old junior at the Urban Science Academy, a small public high school in West Roxbury. Many attendees expressed concern that Trump appointee Betsy DeVos is not qualified to be the secretary of education. Barbara Madeloni, president of the Massachusetts Teachers Association, said she hopes attendees will continue the discussion after the rally — with their legislators and their peers.